I’m not a fan of President Bush. The first one or the second one. Both adopted policies that, on net, reduced economic liberty. Today, let’s focus on the recently deceased George H.W. Bush (a.k.a., Bush 41). By all accounts, he was a very good man, but that doesn’t mean he was a very good president. Or even a mildly good one. Steve Moore’s column in the Washington Times is a damning indictment of his infamous read-my-lips tax betrayal. Liberals love George H.W. Bush for the very tax increase betrayal that destroyed his presidency. …This was not just the political blunder of the half-century, it was a fiscal policy catastrophe. …What the history books are writing is that Mr. Bush showed political “courage” in breaking his “Read my lips: No new taxes” pledge, and he was thrown out of office for doing the right thing. Wrong. 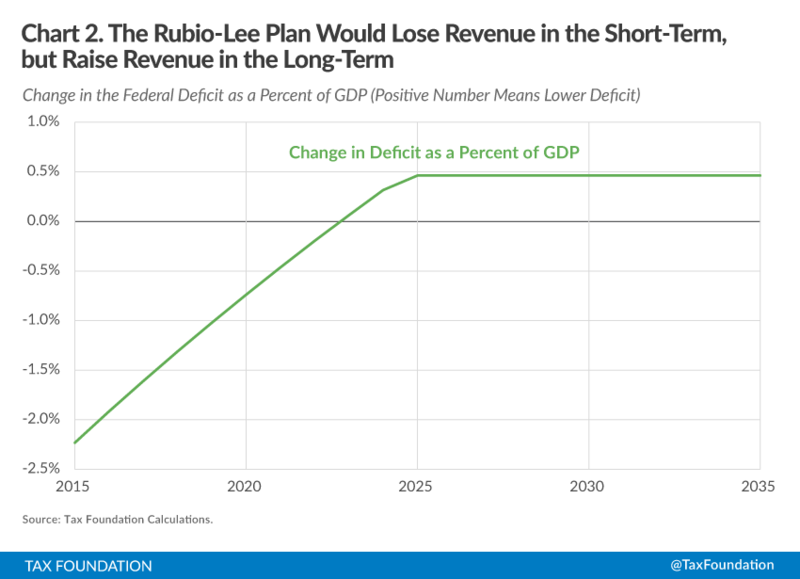 The quick story is that the Reagan expansion — in no small part due to the reduction of the highest tax rates from 70 percent to 28 percent — was shrinking deficit spending dramatically by the end of Ronald Reagan’s presidency. The budget deficit had fallen in half down to 2.9 percent of GDP by 1988. It was headed to below 2 percent if Mr. Bush simply had did nothing. 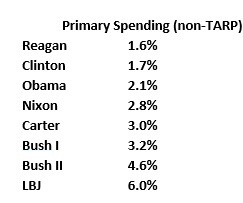 …the 1990 budget deal became a license for Democrats to spend and spend. …Government expenditures accelerated at a faster pace than at any time in 30 years. In two years time, the domestic budget grew by almost 20 percent above inflation. …The tax increases either caused the recession or exacerbated it — ending the Reagan expansion. The economy lost 100,000 jobs and the unemployment rate rose and the unemployment rate rose from 5.5 percent to 7.4 percent. Real disposable income fell from 1990 to the eve of the 1992 election. If this tax hike was a success, so was the Hindenburg. There’s a lot of good analysis in Steve’s column. But I want to emphasize the part about the budget deficit being on a downward trajectory when Reagan left the White House. That’s absolutely accurate, as confirmed by both OMB and CBO projections. All Bush needed to do was maintain the Gipper’s pro-market policies. Unfortunately, he decided that “kinder and gentler” meant putting Washington first and giving politicians and bureaucrats more power over the economy. And not just on fiscal policy. Jim Bovard points out in USA Today that Bush 41 also had some very unseemly bouts of protectionism. 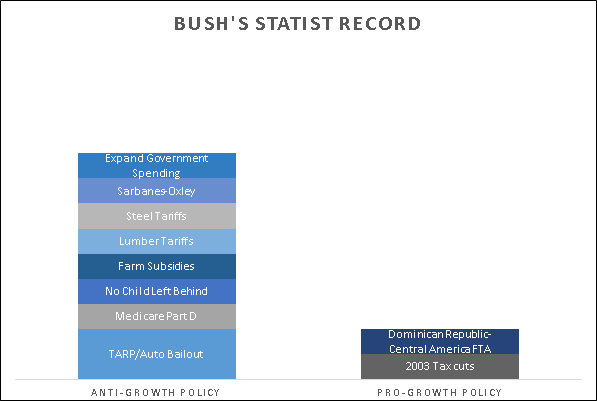 Bush was the most protectionist president since Herbert Hoover. Like Trump, he spoke of the need for level playing fields and fair trade. But Bush-style fairness gave federal bureaucrats practically endless vetoes over Americans’ freedom to choose foreign goods. Bush’s Commerce Department ravaged importers with one bureaucratic scam after another, using the dumping law to convict 97 percent of imports investigated, claiming that their prices were unfairly low to American producers (not consumers). Bush also ordered the U.S. International Trade Commission to investigate after ice cream imports threatened to exceed one percent of the U.S. market. And he perpetuated import quotas on steel and machine tools. …he slapped new textile import quotas on Nigeria, Indonesia, Egypt, the Philippines, Burma (now Myanmar), Costa Rica, Panama, Pakistan and many other nations. Mexico was allowed to sell Americans only 35,292 bras in 1989 — part of a byzantine regime that also restricted imports of tampons, typing ribbons, tarps, twine, table linen, tapestries, ties and thousands of other products. To be fair, George H.W. 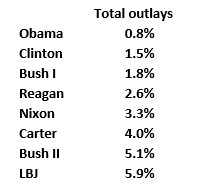 Bush played a key role in moving forward NAFTA and the WTO/GATT, so his record on trade is mixed rather than bad. Let’s return to the tax issue. Alan Reynolds explains that the Bush 41 tax hike was a painful example of the Laffer Curve in action. The late President G.H.W. Bush famously reneged on his “no new taxes” pledge… The new law was intended to raise more revenue from high-income households and unincorporated businesses. It was supposed to raise revenue partly by raising the top tax rate from 28% to 31% but more importantly by phasing-out deductions and personal exemptions… Treasury estimates expected revenues after the 1990 budget deal to be higher by a half-percent of GDP. What happened instead is that revenues fell from 17.8% of GDP in 1989 to 17.3% in 1991, and then to 17% in 1992 and 1993. Instead of rising from 17.8% of GDP to 18.3% as initial estimates assumed, revenues fell to 17%. 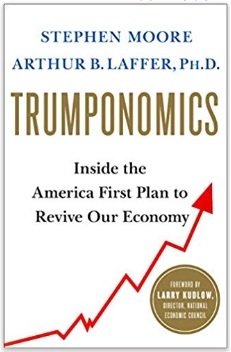 …A recession began in October 1990, just as the intended tax increase was being enacted. To blame the weak revenues of 1991-93 entirely on that brief recession begs the obvious question: To what extent was a recession that began with a tax increase caused or at least worsened by that tax increase? …When discussing tax increases (or tax cuts), journalists and economists must take care to distinguish between intended effects on revenue and actual effects. We’ll never know, of course, how the 1990 tax increase impacted the economy. As a general rule, I think monetary policy is the first place to look when assigning blame for downturns. But there’s no question that the tax increase wasn’t helpful. That being said, my biggest complaint about Bush 41 was not his tax increase. It was all the new spending. 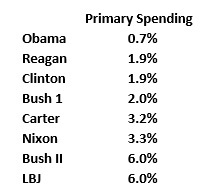 Not just new spending in general. What’s especially galling is that he allowed domestic spending to skyrocket. Almost twice as fast as it increased under Obama and more than twice the rate of increase we endured under Clinton and Carter. The opposite of Reaganomics, to put it mildly. When I get my daily email from the editorial page of the New York Times, I scroll through to see whether there’s anything on economic issues I should read. As a general rule, I skip over Paul Krugman’s writings because he’s both predictable and partisan. But every so often, his column will grab my attention, usually because the headline will include an assertion that doesn’t make sense. Earlier this year, Krugman asserted that America was outperforming Europe because our fiscal policy was more Keynesian, yet the data showed that the United States had bigger spending reductions and less red ink. Last year, he asserted that a supposed “California comeback” in jobs somehow proved my analysis of a tax hike was wrong, yet only four states at the time had a higher unemployment rate than California. And here’s my favorite: In 2012, Krugman engaged in the policy version of time travel by blaming Estonia’s 2008 recession on spending cuts that took place in 2009. And if you enjoyed those examples, you can find more of the same by clicking here, here, here, here, here, here, here, and here. But perhaps he’s (sort of) learning from his mistakes. Today, we’re going to look at Paul Krugman’s latest numbers and I’ll be the first to say that they appear to be accurate. Let’s consider why he’s wrong. 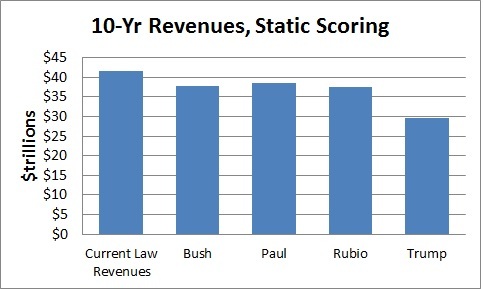 First, he asserts the chart is evidence that GOP candidates shouldn’t follow Bushonomics. I actually agree. That’s because the burden of government spending jumped significantly during the Bush years and the regulatory state became more oppressive. All things considered, Bush was a statist. Krugman, however, would like readers to believe that Bush was some sort of Reaganite. That’s where we disagree. And if you want to know which one of us is right, just check what happened to America’s rating in Economic Freedom of the World during the Bush years. Second, Krugman would like readers to think that Presidents have total control over economic policy. Yet in America’s separation-of-powers system, that’s obviously wrong. You also need to consider what’s happening with the legislative branch. So I added a couple of data points to Krugman’s chart. And, lo and behold, you can just as easily make an argument that partisan control of Congress is the relevant variable. 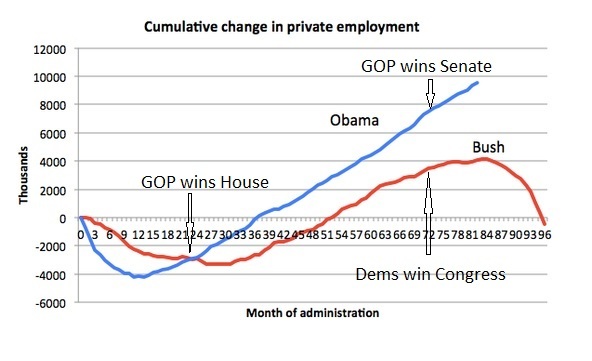 As you can see, Republican control of Congress boosted job growth for Obama, whereas the Democratic takeover of Congress led to bad results during the Bush years. By the way, I don’t actually think congressional control is all that matters. I’m simply making the point that it is misleading to assert that control of the White House is all that matters. What is important, by contrast, are the policies that are being implemented (or, just as important, not being implemented). And since the economic policies of Bush and Obama have been largely similar, the bottom line is that it’s disingenuous to compare job creation during their tenures and reach any intelligent conclusions. Third, since Krugman wants us to pay attention to job creation during various administrations, we can play this game – and actually learn something – by adding another president to the mix. 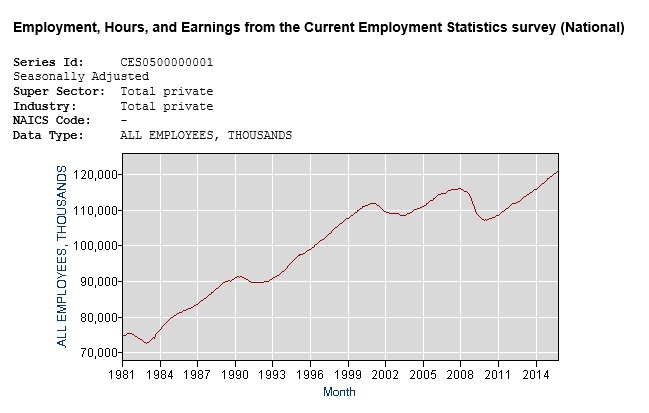 Krugman doesn’t identify his data source, but I assume he used this BLS calculation of private employment (or something very similar). So I asked that website to give me total private employment going back to the month Reagan was nominated. And here’s what I found. 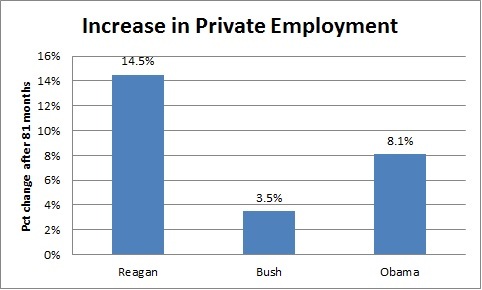 As you can see, good private-sector job growth under Reagan and Clinton, but relatively tepid job growth this century. 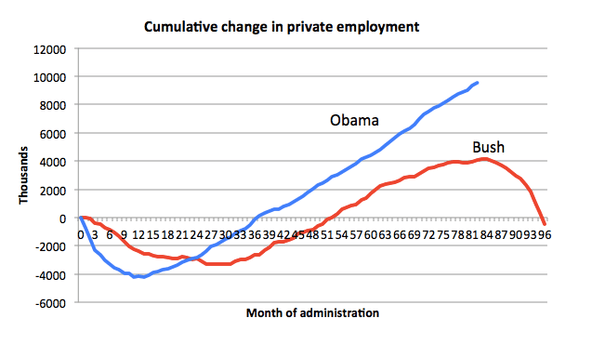 Now let’s take a closer look at the total change in private employment for the first 81 months of the Reagan, Bush, and Obama Administrations. 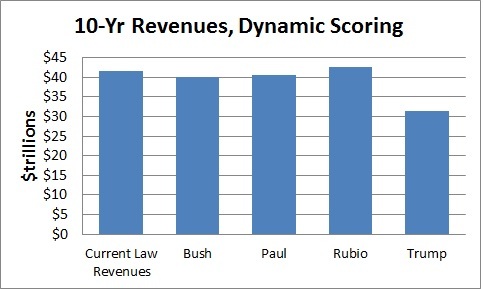 And you’ll see that Krugman was sort of right, at least in that Obama has done better than Bush. And if there’s no recession before he leaves office, he’ll look even better than Bush than he does now. 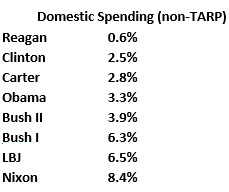 But Obama doesn’t fare well when compared against Reagan. So does this mean Krugman will now argue GOP candidates should follow Reaganomics rather than Obamanomics or Bushonomics? I’m not holding my breath waiting for him to make a correction. By the way, keep in mind what I said before. Presidents (along with members of Congress) don’t have magical job-creation powers. The best you can hope for is that the overall burden of government diminishes a bit during their tenure so that the private sector can flourish. That’s what really enables job creation, and that’s the lesson that really matters. But it’s not easy to find the truth if you put partisanship above analysis. 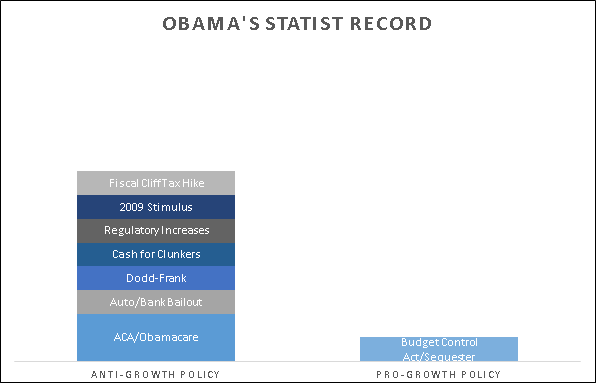 Krugman erred by making a very simplistic Bush-Republican-bad/Obama-Democrat-good argument. In reality, the past several decades show that it’s more important to look at policy rather than partisan labels. For instance, the fiscal policies of Ronald Reagan and Bill Clinton are relatively similar and are in distinct contrast to the more profligate fiscal policies of George W. Bush and Barack Obama. P.S. Paul Krugman’s biggest whopper was about healthcare rather than fiscal policy. In 2009, he said “scare stories” about government-run healthcare in Great Britain “are false.” But you can find lots of scary stories here.